This is my weird "I made pants!!!!" 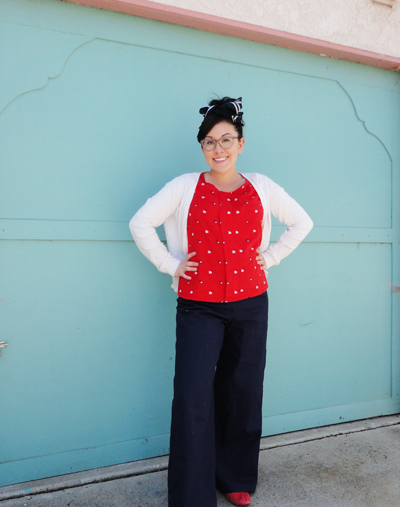 pose because I am so excited to have made 1940s pants for Sew for Victory! I have heard from a few people that Simplicity 3688 is fairly straightforward to sew, so I decided this would be a good first project to help with my fear of sewing pants. This is my wearable muslin and I have mixed feelings about it. On one hand I am really really proud to have made pants, but on the other hand they aren't really my style, so I'm not 100% in love with them. 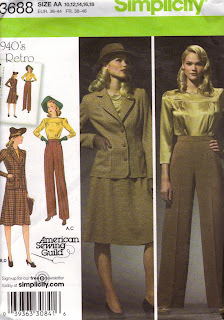 Wide leg high waisted pants are new to me, but maybe I will grow to like them. They certainly are comfortable! As this is a muslin I had no idea what I was getting into, so I cut a size closest to my measurements without making any adjustments. I machine basted the sides to try them out and they were too big. Each side was taken in by 3/8 inch and in hindsight it should probably be more. Fit wise I know there are issues, but I'm not sure I want to try and tackle them. That makes me sound so lazy, but since I'm not 100% in love with these pants I wouldn't feel passionate enough to take the time necessary to fix the problems. I'm going to start fresh with a different pattern that I like more and see how that goes. Serious face. The top is my first Colette make ever, a Sorbetto top from January of last year. It has gotten a lot of wear over the past fourteen months! This twill is a cat hair magnet!!! What is your favorite pants pattern? I think I might try making Colette's Juniper next. Or I might use the pattern in the Pant Fitting Technique class that I am enrolled in on Craftsy. well im in love with those!!!! You are so dang cute Erin! I love the fabric, even if it is a cat hair magnet. :) I haven't attempted any pants yet, and I don't really think that I'm going to. My body type isn't great in pants anyways (hello thunderthighs!) so I like wear/sew dresses primarily. This is awesome looking, and I'm sure the next ones will be even better! I think they look fab! I love high waisted trousers (I'm SOOOOO glad that the hipster trend has well and truly gone) and these look great on you. It's probably just that you're not used to this style, right? Honestly, you look wicked, girlie! Way to go, these pants look great! way to go Erin, you made pants!!! :) I don't love the wide leg look on myself either, but I think you look darling here. Well done. These are great! Maybe if you decide you don't want them I could have them! Also, I love the print on the Sorbetto! You always find great fabrics! They look good on you, however I am not fond of such wide legs. You might want to try the thurlows from Sewaholic too.... they seem to be really easy to sew and easy adjust the leg width. I've seen a couple with tappered legs. YOU LOOK SO CUTE!!! I love the whole outfit!! I'm thinking Colette's Clovers may be more your speed? Sew on, doll! Do it! And please let me know how they turn out. Thanks, Carla. I definitely want to check out the Thurlows, people really seem to like them. Thanks, Rochelle! I'm trying to be in the spirit for Sew for Victory! The only pants I've made are the colette clovers, which I love. They also forgo the fly front so you can focus on fit first--but they're not very vintagey looking. 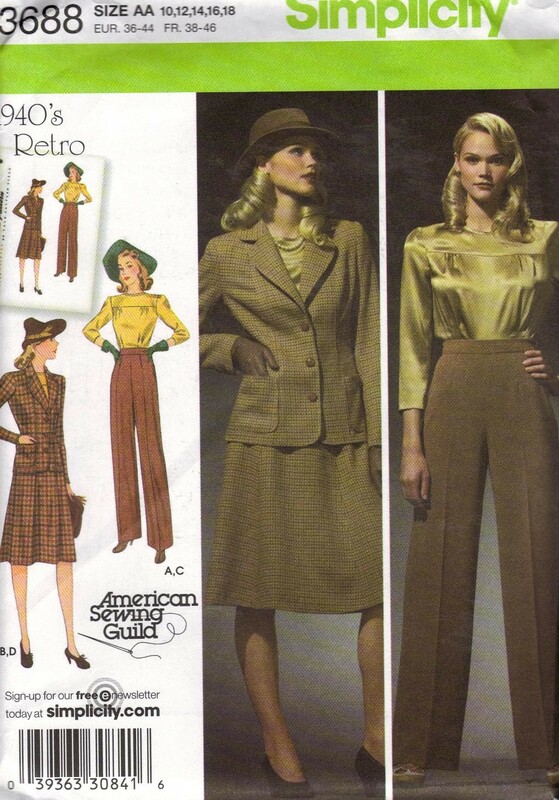 I also have a Vogue pattern in my 'to sew' pile which is supposed to be super easy because there's no darts and they are designed by our holy mother Ms. Claire Shaeffer (link: http://voguepatterns.mccall.com/v7881-products-66.php?page_id=264). Otherwise I super duper want the Juniper pattern. These were the first pants I ever made as well but I love my ones. I made them navy blue with big white buttons. 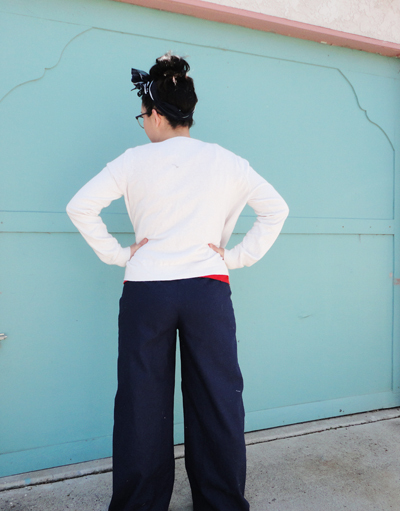 The perfect sailor pants. I'm thinking I need another pair but as shorts next. I would love to make the colette clovers too. You seriously always crack me up with your comments!!!!! Total sailor pants! Shorts would be really cute! These are great...what fitting issues? Seriously, if my first go at pants making ever turns out this good, I'll be delighted. I know you say these aren't really your style, but they suit you really nicely, so maybe they're a nice addition to your wardrobe when you feel like a change now and again? Um: Stop being such an awesome babe in this post! 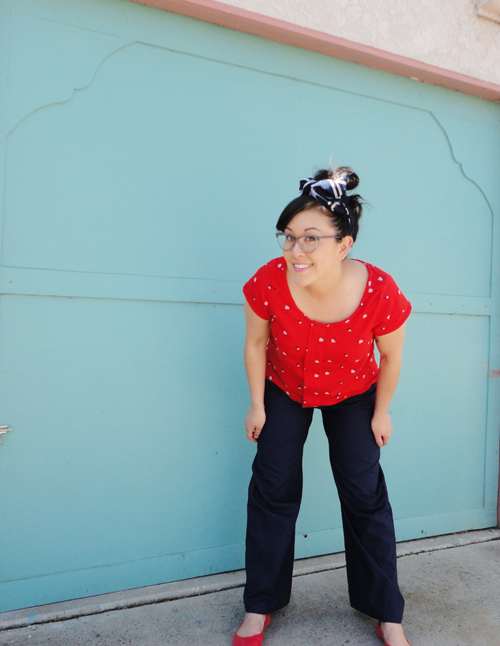 I made a few pants (some 70s ones) when I first started sewing (velveteen ones were my fave, but got rid of them when I moved to a warmer climate!) but I've kinda evolved into a no pants gal. Lately, now that I'm a Mama, I've found it easy to wear leggings but I haven't got around to making some yet... OH WELL! 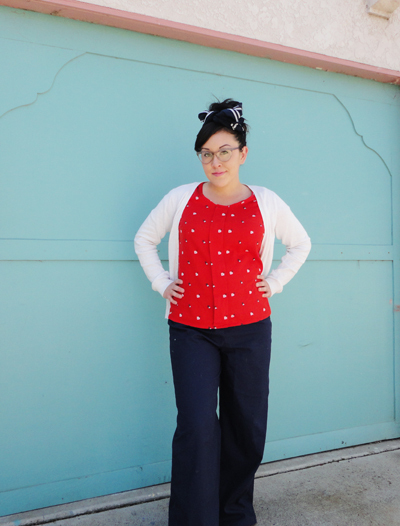 You look great, and they're a great wearable muslin! you are too freaking adorable for words. We should work on Covers together! I definitely need to wear them a few more times. I'm going on a weekend trip soon and they will be perfect for a long car ride. If you find a good leggings pattern will you let me know? I would love to sew some up someday! Carlee, even though I'm not totally in love with the pants I am really happy I made them. It helped with my fear. Thanks, Marie! The waist area is a bit too big. That paired with the wide legs makes it seem like I am swimming in them. If I make the pants again I think I will have to go down a few sizes. Your trousers totally suit you! I love them! These look great and you are TOO CUTE! Great job, dude! 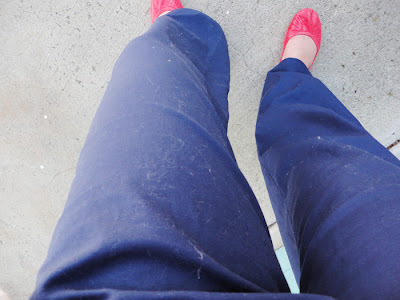 For a first pants affair, they're pretty darn good. Easily a bazilliion times better than my first try, anyway. Maybe it's the vintage-y goodness? I want Craftsy to do a poll - how many people have bought courses versus how many people who have actually DONE said courses. I reckon it would be heavily skewed - I'm an A-grade culprit! Well done, you make pants sound easy! The fit looks pretty good too, yay! I know what you mean about the style, it is quite different :) Looks good tho! I think the fit looks good! For a first time run at pants, they're pretty awesome. I think the Craftsy course could help you understand what fitting issues you might have, which would be a great learning experience, but as far as style, I think the Junipers are super cute! They look great anyway :) Nice job!